Franks Tract is a flooded island located in the heart of the Delta; the island flooded in 1938. A smaller adjacent island, Little Franks Tract, was flooded in 1981. These islands have been flooded for some time relative to other islands and so they are relatively unsubsided, only about 6 to 8 feet below sea level. 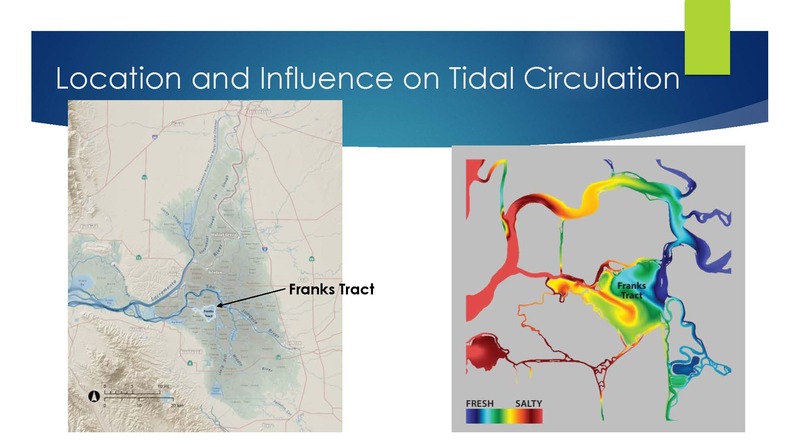 Franks Tract plays a key role in the hydrology of the Central Delta, basically short-circuiting tidal flow that would normally come up the San Joaquin River and then down Old River and directing it instead straight through into Franks Tract and then mixing. 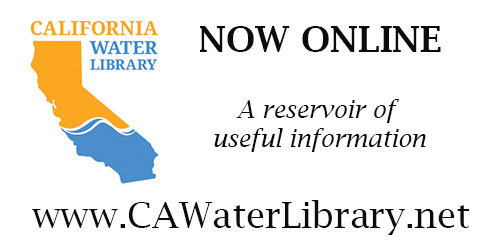 “It has significant water quality effects in the Central Delta and/or for the state and federal water projects, particularly in dry years when salinity can intrude,” he noted. 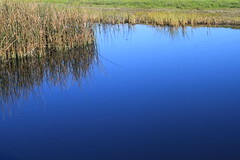 Franks Tract is a shallow flooded island that is dominated by submerged aquatic vegetation that increased substantially during the drought. The vegetation is predominantly historically Egeria but more recently it’s changed to a mix of aquatic vegetation, some of which is native, he said. It’s also a hot bed for predatory introduced fishes, and is a popular fishing location or jumping off point for fishing tournaments in the Central Delta which has a significant economic influence on that part of Contra Costa County, particularly Bethel Island. 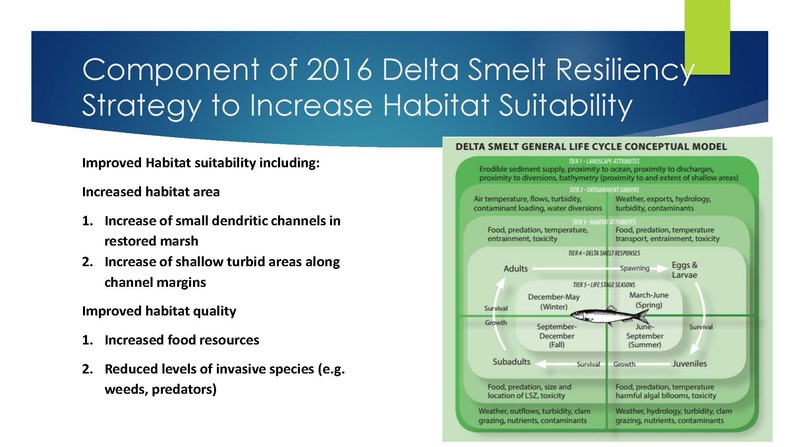 The Delta smelt resiliency strategy was a series of voluntary actions that could be implemented to try to improve conditions for Delta smelt, of which the Franks Tract feasibility study was one of the actions. Another action in the strategy was to increase spring and summer outflow substantially, but that was never been implemented. 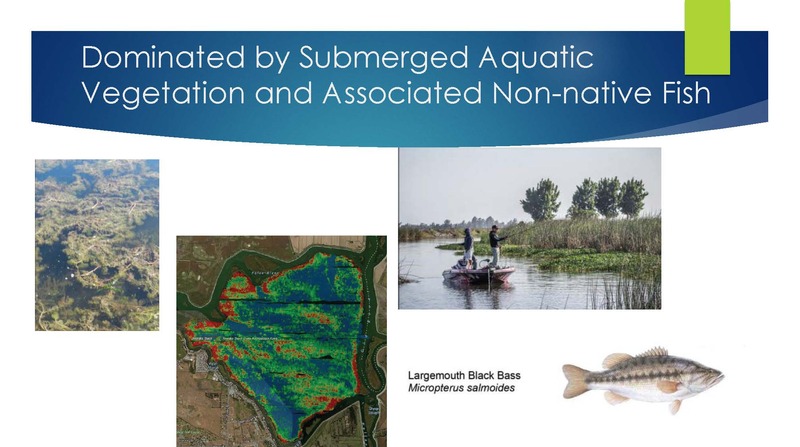 However, other actions were, such as the reoperation of the Suisun Marsh salinity control gates that was intended to improve habitat conditions in Suisun Bay and Montezuma Slough for Delta smelt, particularly during lower outflow periods, and the Yolo Bypass Food Web Enhancement effort, which flushed primary and secondary production out of the Yolo Bypass and into Cache Slough and the Lower Sacramento River towards Rio Vista which has shown promising results. The objectives for the restoration effort were to enhance habitat conditions for smelt and native species and/or pelagic fish, minimize habitat for non-native fish and invasive plants, create elevations to establish large areas of emergent vegetation, and then physically modify the tidal circulation to create conditions similar to historic conditions. 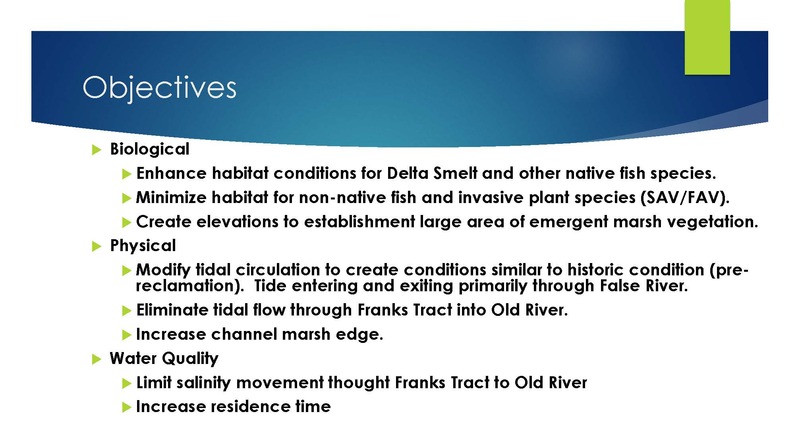 Other objectives include eliminating tidal flow through Franks Tract into Old River, increasing channel margin edge, improving or eliminating salinity movement through Franks Tract into Old River, and increasing residence time. The conceptual design relies on the products of San Francisco Estuary Institute’s A Delta Renewed which provides guidance for pursuing restoration activities that reclaim some of the historic features of the Delta. 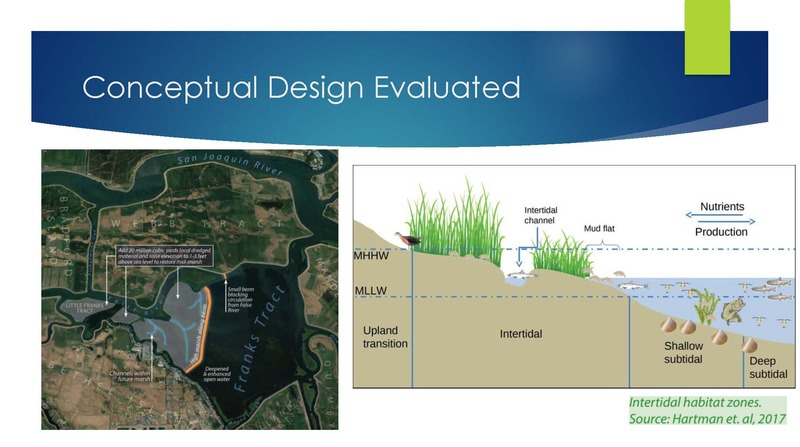 A Delta Renewed focuses on reestablishing critical biological processes such as full tidal action within the restored habitat, complex and variable patterns of tidal inundation, and the ability to maintain itself over time. “The focus here is reestablishing intertidal marsh within Franks Tract that has some capacity to keep up with sea level rise, potentially,” he said. In applying A Delta Renewed, there are various metrics. 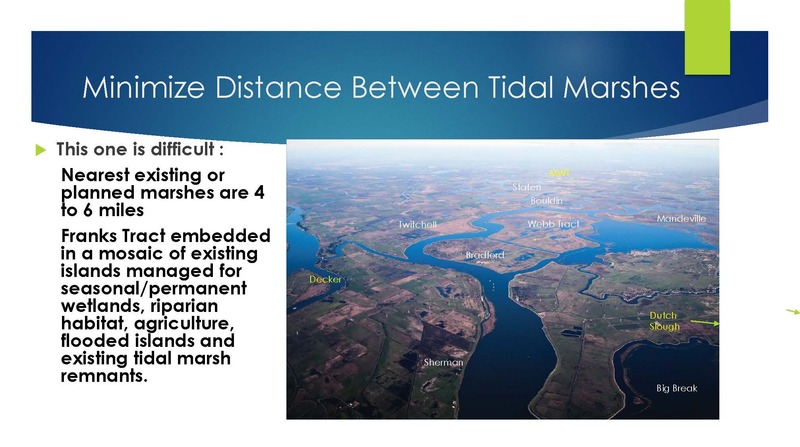 For marsh restoration, there’s basic criteria of about 1000 acres or 500 hectares to support tidal slough systems. 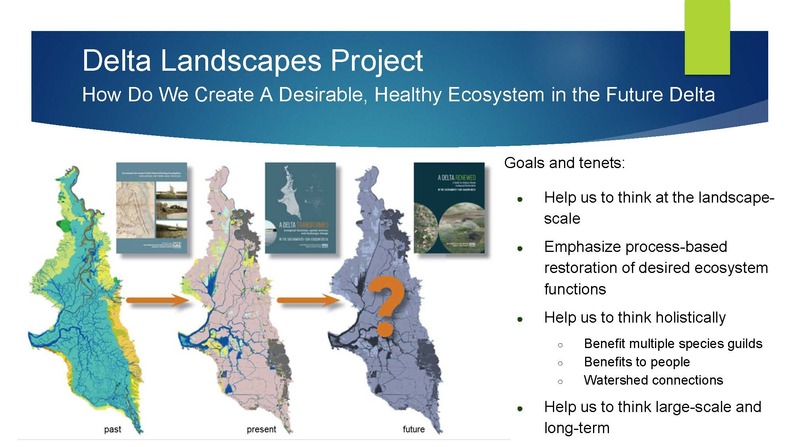 The guidance also suggests trying to restoration projects as close to other projects as possible; Mr. Wilcox acknowledged that’s problematic in this part of the Delta, although there are projects that are underway around it. The guidance also suggests a higher ratio of marsh core to edge as most of the marshes that remain in the Delta are little fragments so they have a really high edge to core area and so they don’t really function particularly well, he said. 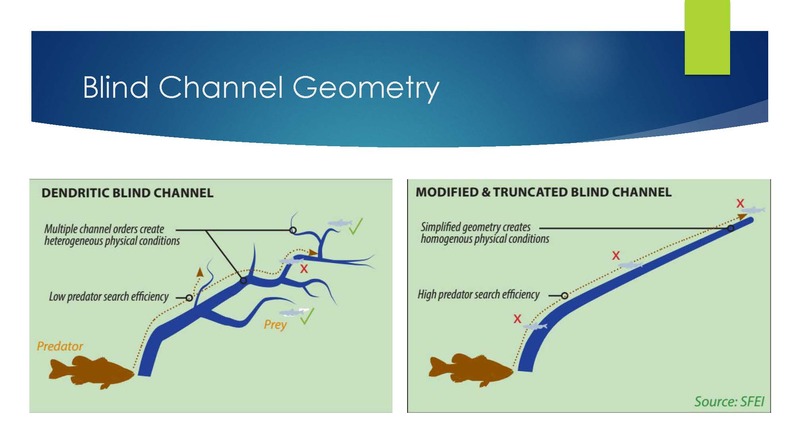 For channel metrics, the guidance recommends that channels should be long and branching, have a long tidal excursion, and be embedded within the marshes; he acknowledged this isn’t currently the case in most of the Delta. Mr. Wilcox then dove deeper into the metrics. Patch size is recommended to be greater than 500 hectares, but they were unable to achieve that with the conceptual design. He noted that the recommendation to locate the restoration in proximity to surrounding marshes as there aren’t any existing marshes in the area, and the nearest restoration projects are four to six miles away. With respect to marsh metrics, the guidance recommends more core than edge to reduce disturbance and access by predators. 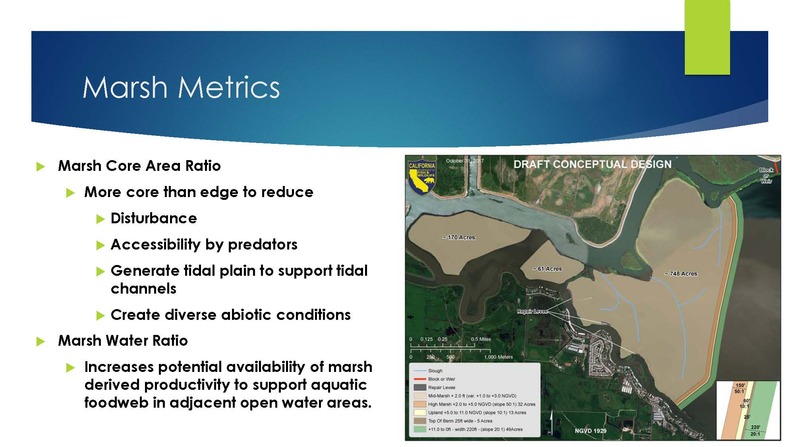 The recommendation is to generate tidal plains, support tidal prism and water movement through the restored tidal channels, and create more diversity in the habitat features in the marsh. 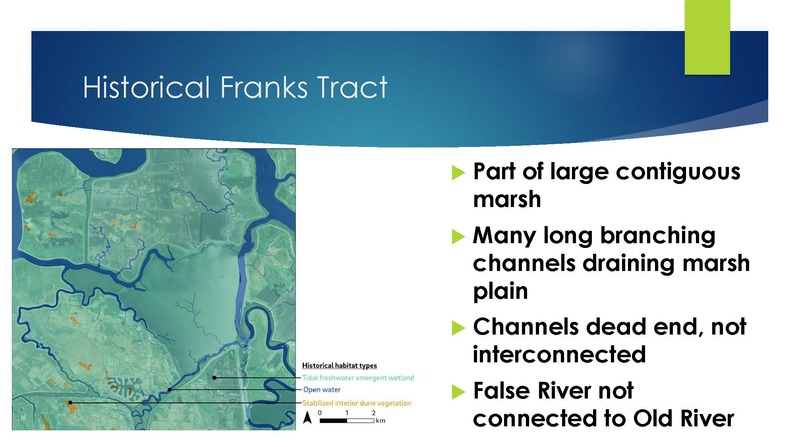 Historically Franks Tract was part of a large contiguous marsh that consisted of Bradford Island, Webb Tract, Franks Tract, Jersey Island, Bethel Island, Hodgkiss Tract, and Holland Tract. It was all one big marsh; it didn’t have any through connections, he said. Key elements of the design a large berm across Franks Tract and a small berm across False River to block it, and it involves substantial dredging, he said, noting that dredging on-site gives two benefits, one being creating the marsh plain and the second being deepening the remainder or a portion of the remainder of Franks Tract into deeper water that is deep enough to prevent submerged aquatic vegetation to take root, he said. Mr. Wilcox said that the study determined that the project would be feasible to do, although expensive, but the kinds of habitat conditions that were intended can be created. 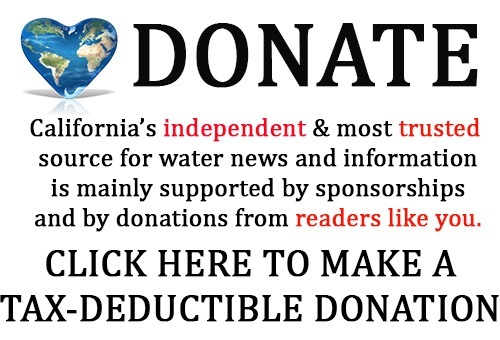 “It also has the potential, at least in the conceptual design that was developed, to reduce entrainment of fish from the western Delta,” he said. 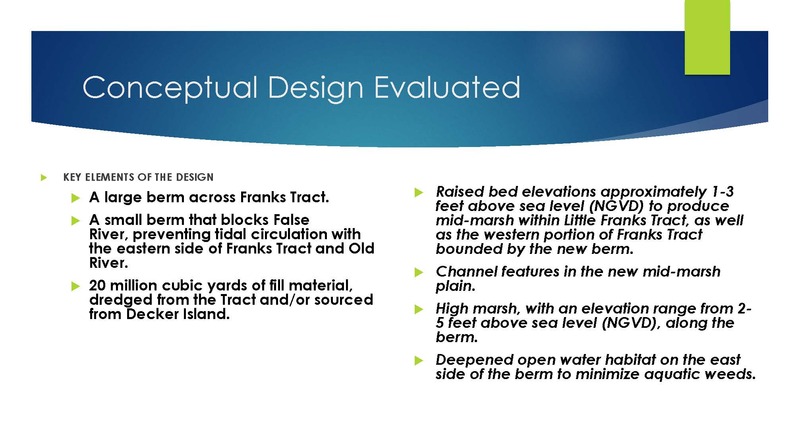 The approach was modified to use onsite material and create areas of deep open water habitat in addition to marsh, channel and shallow water and to increase habitat heterogeneity; the other big benefit is that it provides water quality improvement, he said, noting that the project is an example of reconciliation requiring an recognition that Franks Tract/Delta is a ‘novel’ ecosystem. Mr. Wilcox noted that an alternative design was developed based on local input; one of the next steps is to engage with community to refine designs and come up with alternatives that potentially work better. 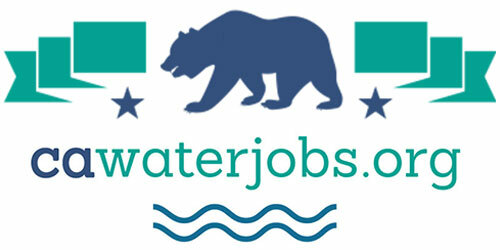 Click here for the Franks Tract Feasibility Study. Click here for more information on A Delta Renewed.